The chimney stacks at Halswell consist of two distinct groups; those hidden within the formal architecture of the Baroque north wing, and those that survived from the Tudor manor with its later additions in the 1590’s and beyond. 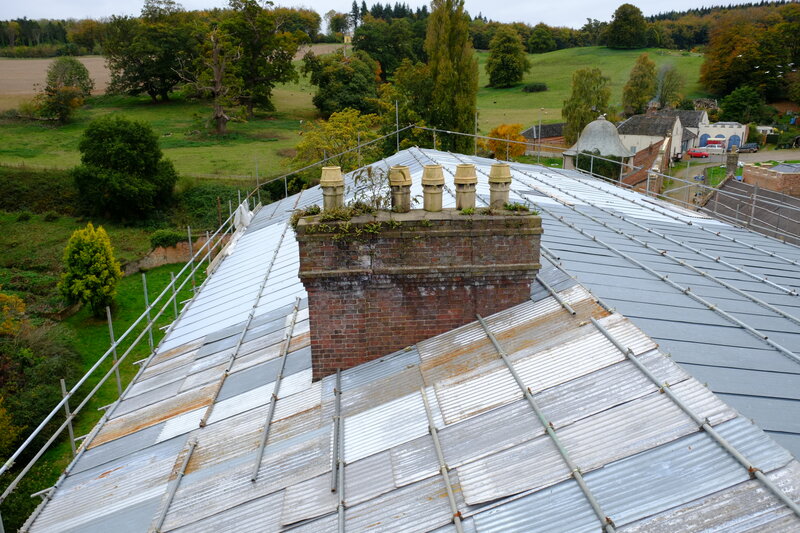 During the nineteenth century and the 1920s all of the chimneys were rebuilt above the roofline, either using big new redbrick stacks typical of a robust Victorian roofline, or hidden completely within the parapet of the seventeenth-century Baroque wing. As enticing as it seemed for us to remove the Victorian redbrick and attempt to re-create the older mix of chimneys, there were no remaining features to work with, and although the Victorian brick has a different feel, they are honest indicators of the house living through that period, and as such are important historically in their own right. Therefore, in consultation with conservation authorities, the decision was made that the redbrick would be maintained, and the mixture of twentieth century pots that cap them should be removed and replaced with more sympathetic features. In this c.1898 photo of the Tudor manor house, from left to right the chimneys marked in green are C18 & C19th in creation. The left-hand red highlighted stack dates from c.1590 and services the sixteenth-century kitchen on the ground floor of the south range as well as the rooms either side of that on the floors above. The small red stack in the centre serviced two rooms at the south of the north range but was removed above parapet level in the 1920’s, in line with the other chimneys in the north range. The largest stack, to the far right of the photo, is the oldest and dates from the building of the Tudor Great Hall on the ground floor and services the rooms either side of the visible gable of this building. The 1920’s redbrick replacement that now tops the Great Hall stack. Utilitarian pots from the early C20th. 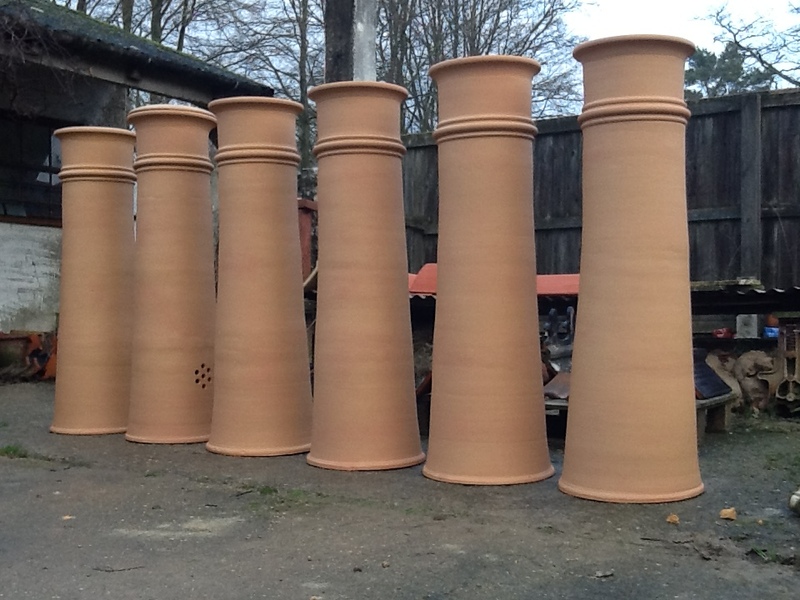 Clay chimney pots (larger than those made for Halswell), being thrown by West Meon Pottery, specialists who have re-created period pots for The National Trust, The British Museum and Kensington Palace amongst others. Halswell’s new made-to-measure chimney pots for the Great Hall stack on the east range. 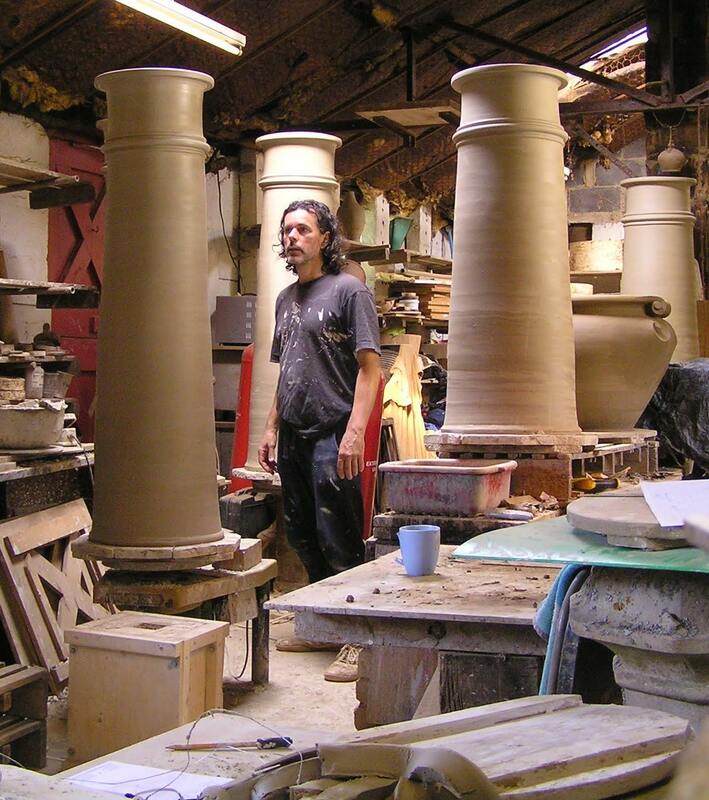 At 47 inches high the pots are made to a design first created in Bridgwater in the nineteenth century. The clay colour has been matched to the local ham stone that is used in the stone mullion windows throughout the old manor complex. Similar pots are being made for the other Tudor manor chimneys and will be installed in early 2016. 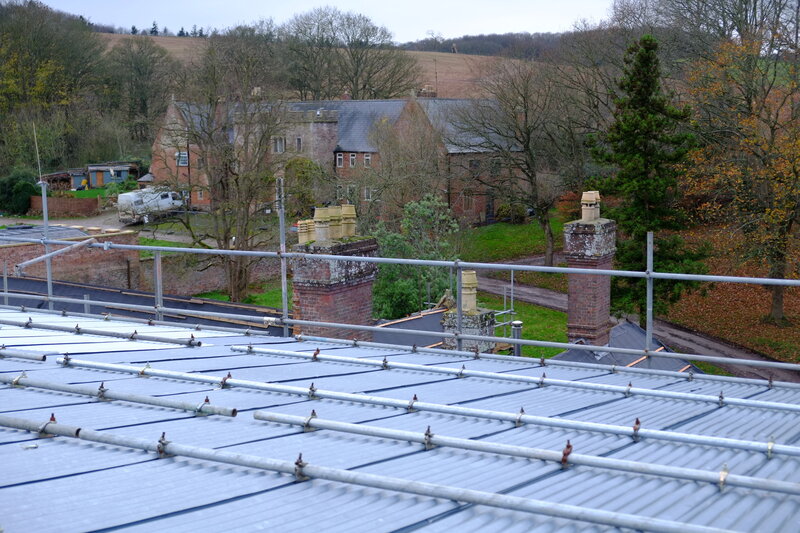 We’re looking forward to posting photos of the of the chimney capping soon! The size of these chimneys is quite incredible. I dare say they would have to be hoisted up by a crane.